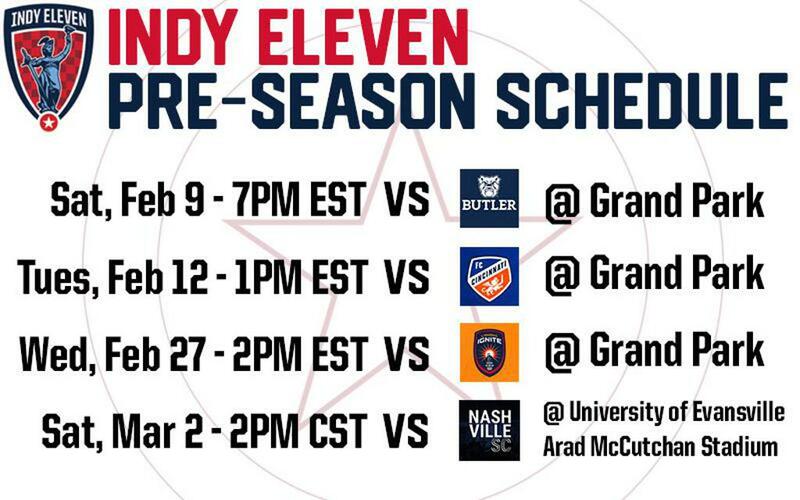 Indy Eleven Professional Soccer announced today the team’s preseason schedule leading up to the start of the 2019 USL Championship season. Players will report to training on Friday, January 25 to begin preparations for the upcoming season. The Boys in Blue will open their preseason slate against Butler University Men’s Soccer at the Grand Park Events Center on Saturday, February 9 at 7:00 p.m. ET. This matchup is the fifth time in the last six seasons that Indiana’s Team has taken on the collegiate side. The game will be exclusively open to Indy Eleven season ticket holders. Indy Eleven will host newly-minted Major League Soccer side FC Cincinnati on Tuesday, February 12 at 1:00 p.m. ET and new USL League One expansion side Lansing Ignite on Wednesday, February 27 at 2:00 p.m. ET. Both matches will be hosted at the Grand Park Events Center and are open to the public. The Boys in Blue will wrap up their preseason on the road in a friendly against USL Championship rivals Nashville SC. The match will take place on neutral ground at the University of Evansville’s Arad McCutchan Stadium on Saturday, March 2 at 2:00 p.m. CT (3:00 p.m. ET). Tickets to the match will be available for $5 at the stadium’s gates. Details concerning additional preseason fixtures will be announced in the coming weeks. The start of the 2019 USL Championship season is just around the corner. Join us for 17 home games at Lucas Oil Stadium this year! Season Ticket packages start at $99. Visit IndyEleven.com/Season-Tickets or call (317)685-1100 for more information.